As many of you know, KTLA was the first TV station to be awarded a commercial license west of the Mississippi in January 1947 and was an industry pioneer both technically and with programming, production and especially news. 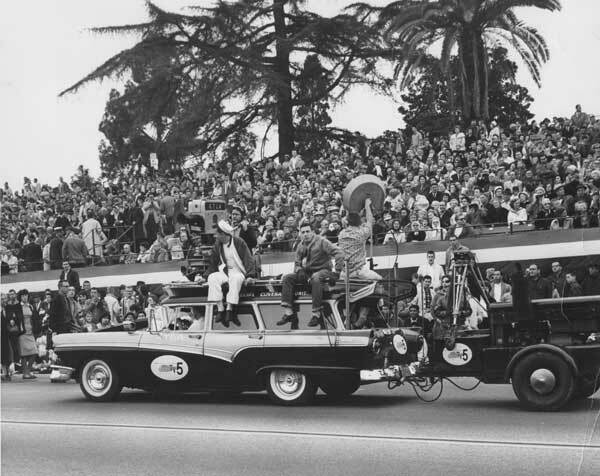 From its beginnings, KTLA broadcast the annual Tournament of Roses parade from Colorado Boulevard in Pasadena and in 1955 began carrying the spectacle in color after having acquired two early TK-40 camera chains. The station was one of the first, if not the first, to purchase the cameras and associated transmission equipment after RCA had supplied some of its owned and operated stations. KTLA also color-cast some of its locally originated musical-variety entertainment programs. 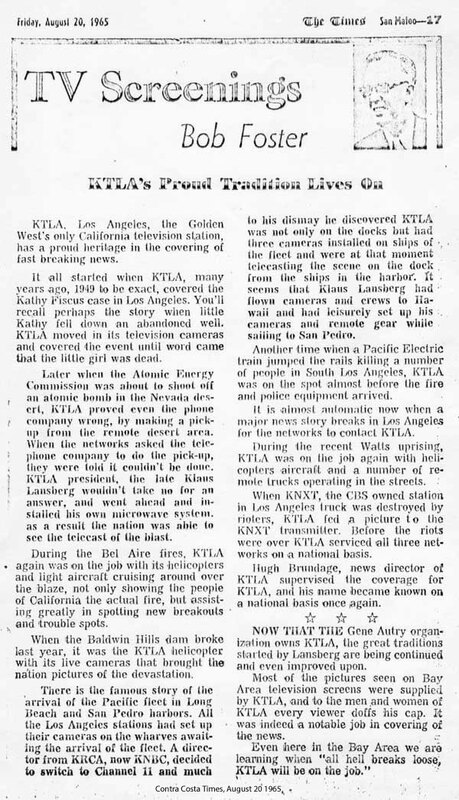 In the late 50s and early 60s, following its live b&w broadcast, KTLA would show the parade for a second time, also live, from a location close to end of the 5.5-mi. route. The following images were captured on Jan. 1, 1960. First, here’s a look at the b&w set-up located behind the viewing bleachers in the Elk’s Club parking lot on the south side of Colorado near the start of the route. At the bottom of the frame is Mobile Unit No. 7 (7-truck in employee parlance), KTLA’s largest at the time. As with all of the station’s mobile units starting with its first cramped panel truck used during experimental transmissions during the early 1940s, 7-truck, was home-built. Atop the bleachers can be seen a camera and the microwave relay dish which sent the signal to the Mt. Wilson transmitter site. Other cameras were located elsewhere in the bleachers and at street level. There were no cranes, high-tech switchers or other production enhancement paraphernalia commonly used today, so 7-truck was large enough to handle the job alone. This photo shows another view of the same scene. 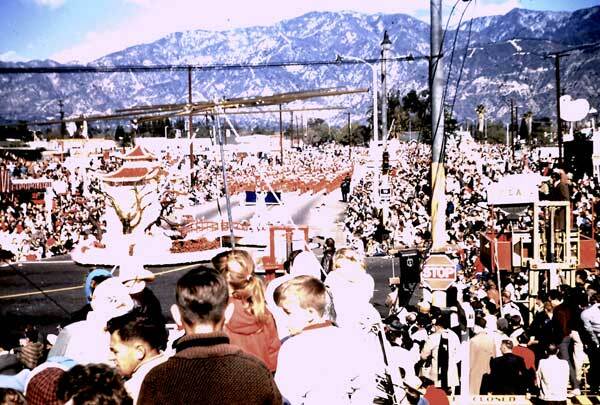 Moving on to color coverage, this photo shows one of the TK-40s (far right) following the parade as it turns from Colorado onto Sierra Madre Boulevard. It’s a clear, smog-free day in the Los Angeles basin, a relatively rare treat in those days. The camera has been placed on a platform attached to a rented yellow forklift that is all but swallowed up by the crowd but provides an excellent vantage point for viewers. The second TK-40 is barely visible in the lower center of the picture on an orange forklift in front of the crowd at the curbline. This photo provides a closer view of the forklifts, which remained in fixed positions during the parade, which had just ended. The crowd, which each year always exceeds 1 million, is beginning to disperse. The cameraman on the yellow machine is Jim Cassin. This photo, taken on the roof of an adjacent building, shows Cassin’s TK-40 and the microwave relay dish sending the color signal to Mt. Wilson, the highest peak in the San Gabriel mountain range which frames the L.A. basin. It was home to the then-seven television transmitters serving the region, which stretches east and south to the cities of San Bernardino and Riverside and all of Orange County. 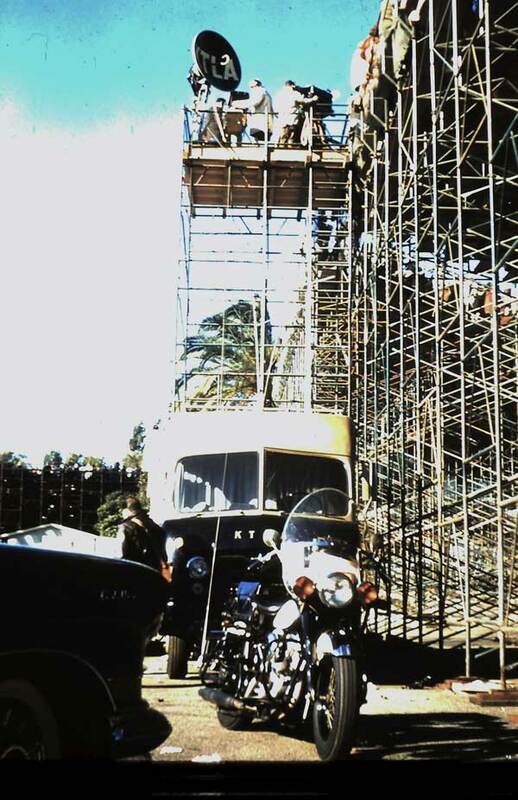 KTLA’s color mobile unit (not shown) was also home built. It was a single-axle trailer that included a control room with a switcher, audio equipment, camera control units and storage space for the cameras and their bulky cables. 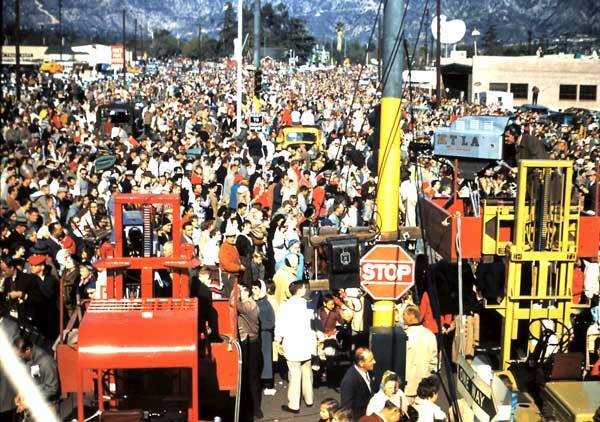 A fifth-wheel tractor would be hired each time the unit had to be moved to the parade or any other remote site. The trailer was also utilized when studio programs were broadcast in color. When regular colorcasts ended, the trailer was stored on the KTLA lot for many years. This photo, a KTLA publicity shot, is truly a time capsule showing the essence of one of the most advanced television news operations of its time, with an experienced staff and more resources than any other station in Los Angeles. Left to right: Bruce Cohn-newswriter, George Lewin-News Director; William J. McDonald-news program producer/director, Clete Roberts-anchorman, reporter and highly respected foreign correspondent; Pat Michaels-local reporter, Tex Ziegler, Ed Clarke and Russ Day, all veteran newsreel photographers; Larry Scheer-Telecopter pilot-reporter; Harold Morby-Telecopter engineer-cameraman; and Jim Karayan-Assistant News Director/Assignment Editor. Roberts was cut from the same cloth as Edward R. Murrow, covering World War II, the Korean War and other news hotspots before settling in Los Angeles in the mid-1950s. He was not only a journeyman reporter, he very much looked the part of a quintessential foreign correspondent. He formed his own company, U.S. Television News, which he brought to KTLA as part of a package deal that included himself and the film crews. On the ground next to Ziegler, Clarke and Day is all of their gear including 16mm cameras employing optical soundtracks; magnetic-stripe newsfilm was just coming into widespread use. The first vehicle on the left was KTLA’s “Special Coverage Unit,” a 1957 Ford station wagon designed for fast coverage of breaking news. It had a heavily reinforced suspension and towed a generator robust enough to power one camera, audio equipment and the folding, roof-mounted microwave transmitter. The rear seats were removed to make room for the control gear and an engineer’s operating position. The Special’s generator could be started before it left the studio and by the time it arrived on-scene, the camera chain would be warmed up and ready to go. KTLA’s other mobile units were forced to find power sources at homes or businesses near the scene of a brush fire, plane crash, explosion or other disaster before going on the air. Next to the Special are the station’s three conventional mobile units, 4-truck, 5-truck (both International products from the late 1940s) and 7-truck. Mobile units were numbered consecutively from the station’s beginning, so the Special would have been number 6. Only 5 and 7 were equipped with control rooms; 4-truck carried a microwave transmitter along with extra camera cable and other gear and could operate a “double-hop” relay if the other trucks were not line-of-sight to Mt. Wilson. Earlier units had been scrapped by this time but 1-truck can be seen on Early Television’s W6XYZ Web page. Finally on the right is KTLA’s engineering triumph, the Telecopter. Developed by then Chief Engineer John Silva and his staff, the Telecopter was a miniature broadcasting station using existing tube-powered equipment that had been sliced and diced to reduce weight and size. Even so, the piston-engine Bell 47J Ranger, leased from National Helicopter Service, was right at permissible gross takeoff weight when fully fueled. Morby is holding the zoom lens-equipped vidicon camera that was aimed using a gunsight-type viewfinder. Behind Scheer is part of a shortened UHF helical antenna mounted on a motor attached to the landing skid that folded down once the copter was in flight. The Telecopter was the first of its kind to be used by a U.S. TV station on a daily basis and gave KTLA a huge competitive advantage in the coverage of news and special events such as the Rose Parade. 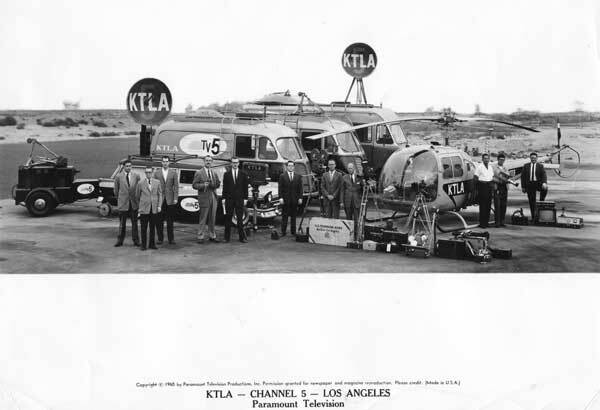 KTLA had the reputation for breaking into regular programming whenever a major story occurred and from 1958 onward it was the Telecopter that was first at the scene. On the ground next to Karayan is the newsroom base station for the 33 MHz two-way radio system that was used to contact the Telecopter and film and live crews. It was state-of-the-art telecommunications in the late 1950s. Finally, this photo shows the Special in action at either the 1961 or 1962 Rose Parade taking part in the pre-parade show before the march began. 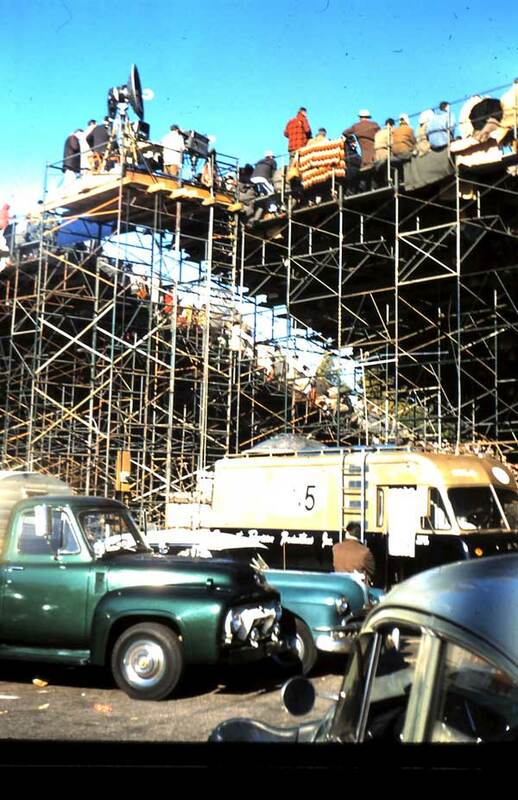 By this time a reinforced platform had been installed on the roof along with a rather elaborate rotating camera mount with a seat for the operator, which helped facilitate news coverage. Note also that tripod storage had been moved from the top of the generator, where it got too hot, to the equipment box behind the hitch. The microwave dish was probably being pointed at the Telecopter, which could relay a ground signal from the slowly-moving Special to Mt. Wilson; note the engine hood of the vehicle which had been cracked open to provide additional cooling. One of the hosts for the pre-parade program was actor Tom Hatten, shown sitting atop the Special dressed in a sailor’s uniform. Hatten had a one-hour weekday afternoon children’s program on which he showed mainly Popeye cartoons, thus the sailor costume. Today KTLA remains a news leader in the Los Angeles market but must complete on equal footing with other stations that also have instant live capability from ground units and helicopters. The station also continues to achieve high ratings telecasting the Rose Parade every New Years day.